Did you know that the city of West Hollywood is planning a huge redesign of La Brea Avenue? It’s is an amazing opportunity to fix a street that currently suffers from some of the worst congestion and hazardous intersections in West Hollywood. Fortunately, La Brea also enjoys a high concentration of great destinations, diverse growth, and proximity to pleasant neighborhoods. A bike lane would be an easy, inexpensive way to capitalize on West Hollywood’s easternmost assets, and effectively reduce the inconveniences of a city that’s growing by leaps and bounds. WeHo’s Notice of Intent to Adopt a Negative Declaration incorrectly claims that LA plans to paint sharrow stencils on La Brea. But the city of LA has proposed bike lanes — not sharrows — for La Brea Ave in its 2010 bike plan. If West Hollywood’s portion of La Brea isn’t built with connectivity to LA’s future bike lanes, it could cost a lot of money to fix — and it could even cost lives. Contact the City of West Hollywood and let them know that we need bike lanes. The comment period for the Notice of Intent to Adopt a Negative Declaration closes very soon: 5pm on February 28. Click here to send an email of support for bike lanes. We’ve written it for you already, so it takes less than 60 seconds to send! And of course, follow us on Facebook, Twitter, and email newsletter to get updates on our progress with this and other projects. As luck would have it, the city of West Hollywood has already conducted a study that calls for bike lanes on La Brea. The recommendations of the Bicycle Task Force include the installation of Class II (that is, non-buffered) bike lanes on La Brea Ave. The report was unanimously approved by City Council in December of 2011. La Brea bike lanes are also indicated by West Hollywood’s Climate Action Plan, the General Plan, and even the request for proposals for this very project. Wouldn’t Bike Lanes Just Slow Traffic Down? No. It might seem counter-intuitive at first, but when done correctly, bike lanes can help move traffic along faster. How’s that? Well, bike lanes keep cyclists separated from faster-moving traffic, eliminating the need for cars to change lanes or suddenly slow down to pass bikes. They also reduce conflicts between bikes and cars at intersections. And dedicated lanes allow bikes to move safely forward through traffic, rather than swerving hazardously between stopped cars. And of course, the biggest benefit of all: with more bike lanes, more people bike instead of drive, so there’s an overall reduction in traffic on the road. What’s more important for La Brea: a giant landscaped median that simply looks nice, or bike lanes that can actually save residents’ lives? There’s no argument that bike lanes will make La Brea safer for everyone — not just cyclists, but pedestrians and motorists, too. 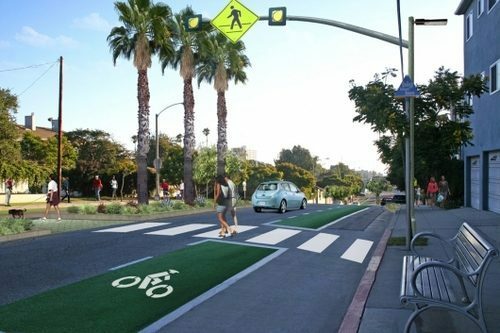 When Long Beach installed bike lanes, bike accidents decreased by 80%, vehicle accidents decreased 44%, and sidewalk-riding decreased from 70% to 28%. LADOT’s own study showed that bike lanes can reduce accidents by 35%. That reduction isn’t just for cyclists — it also includes collisions between cars. With numerous new pedestrian-oriented projects under construction on this already-busy street, bike lanes are an easy, cost-effective way to reduce accidents and injuries. If the street’s wide enough for a median, it’s wide enough for bike lanes. Page 14 of the plan specifies that the Los Angeles portions, which are immediately to the north and south of West Hollywood’s portions, are slated to be backbone bike lanes.